On 22 November 2018, Eastern Partnership Civil Society Forum (EaP CSF) took part in a PAR – Public Administration Reform Panel Seminar, entitled “Ensuring Gender Equality in the Public Service” in Kyiv, Ukraine organised by National Agency of Ukraine on Civil Service, Civil Service Center for Adaptation of EU Standards and Friedrich Ebert Foundation. Attending the event on behalf of EaP CSF, Ketevan Kurtskhalia (Women’s Political Resource Center, Georgia) and Antonina Volkova (NGO “Vesta”, Moldova) spoke of their experiences of gender policy, particularly in the context of decentralisation and gender mainstreaming. 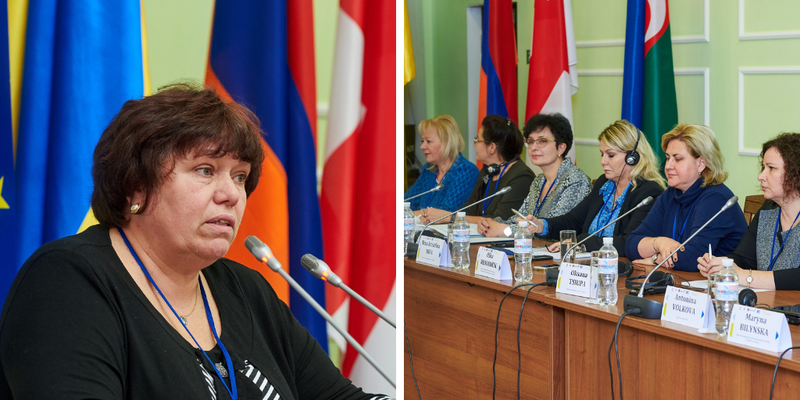 The seminar compared different approaches to ensuring gender equality – and their practical application in the public service of EaP countries. The aim of the event was to exchange best practices and understand gender policy from an implementation point of view – bringing stakeholders from all levels of government (including members of the Ukrainian Cabinet of Ministers), civil society and international organisations, working in the region. Gender mainstreaming has to be addressed at the local level as well, heard the Panel’s participants. In this respect, there are many success stories – as showcased by several Regional Agencies of Ukrainian Public Service. In the later part of the seminar, the participants had a chance to exchange contacts and discuss joint future activities, which encompass both public sector and CSO – civil society organisations across EaP countries.